First step: figure out what we already know. No need to re-invent the wheel. For that, Brierley turned to Dr. Mike Matheron. Matheron is an extension plant pathologist and professor at the University of Arizona’s Yuma Agricultural Center. When the disease first migrated to California and Arizona at the turn of the twenty-first century, Dr. Matheron and others from the U of A and UC Davis undertook research to better understand the disease and how to fight it. Fusarium wilt of lettuce (Figure 1) is caused by the soil-borne fungus Fusarium oxysporum f. sp. lactucae. This particular form of Fusarium oxysporum is known to cause disease and visible symptoms only on lettuce. There are three reported races of Fusarium oxysporum f. sp. lactucae. All three races of the lettuce pathogen are present in Japan, whereas only race 1 is known to occur in the United States (Arizona and California), as well as in Argentina, Brazil, Iran, Italy, Portugal, and Taiwan. The plant pathogenic forms of Fusarium oxysproum can also live on dead plant tissue when living host plants are not available, enabling the pathogens to survive in soil indefinitely. Forms of Fusarium oxysporum that are not plant pathogens also reside in soil, living only on dead plant tissue. Figure 1. Foliar symptoms of Fusarium wilt include yellowing and necrosis of leaves as well as stunting and wilting of plants. Fusarium oxysporum f. sp. lactucae invades lettuce plants through small roots, then grows within the xylem tissue, which transports water and nutrients from roots to plant foliage. As the pathogen advances into the plant taproot and lower stem, the xylem tissue becomes plugged by the fungus and byproducts of its presence, resulting in restricted water uptake, stunting, wilting, and often plant death. Plants infected when older may survive but are usually stunted. Taproots of infected plants look normal externally; however, examination of internal tissue usually reveals the presence of a reddish-brown discoloration (Figure 2). Fusarium wilt was first found in the United States in 1990 within a lettuce field in Fresno County, California. In Arizona, the disease was first observed in 2001 in six Yuma County lettuce fields. The number of fields known to be infested with Fusarium oxysporum f. sp. lactucae in Yuma County had increased to 50 by 2010, with further increases thereafter. Figure 2. Reddish-brown to black necrosis of internal taproot and crown tissue is a common symptom on lettuce infected with Fusarium oxysporum f. sp. lactucae. Disease resistant plants. The most effective management tool for Fusarium wilt of most hosts is to grow plants with genetic resistance to the pathogen. Unfortunately, 88 crisphead, 6 green leaf, 5 red leaf, and 4 butterhead varieties tested in Arizona in 2002 and 2003 were very susceptible to Fusarium wilt (Matheron et al. 2005). On the other hand, some of the 20 romaine varieties in the same trials, especially BOS 9021, King Louie, and Slugger, were quite resistant or tolerant to the disease. Two recent field trials conducted in 2015 again demonstrated that romaine cultivars (Valley Heart, King Henry, Rio Bravo, Green Thunder, and Vanguard PIC) were less affected by Fusarium wilt than crisphead cultivars (Midway, LT 4083, Raider, Prestige, Sunquest, Dover, and Crusader). However, Midway sustained significantly less disease than all other tested crisphead cultivars in one field trial. Sanitation. The goal of implementing sanitation procedures is to minimize the movement of Fusarium oxysporum f. sp. lactucae from infested to noninfested fields. Any farming operation or activity that can move infested soil or plant material may spread the pathogen, such as seedbed preparation activities, cultivation, harvesting operations, use of contaminated irrigation pipe, workers’ footwear, tractors and other farm equipment. 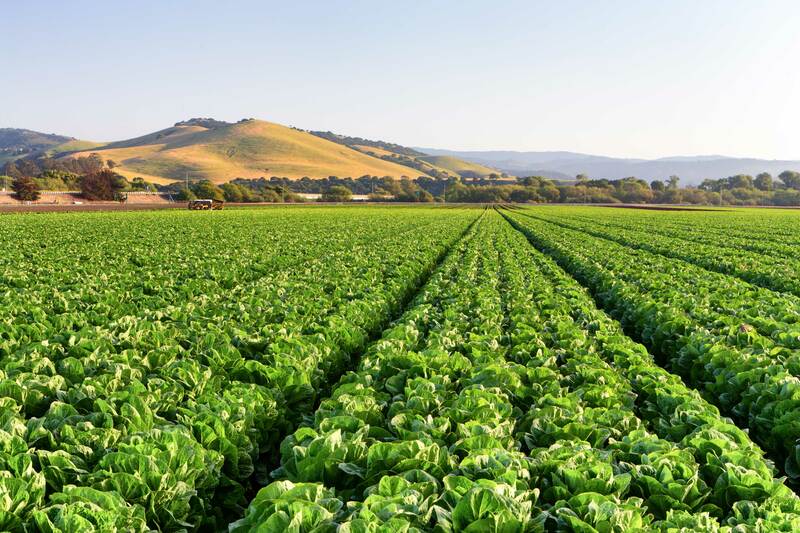 To be successful, these sanitation procedures must remain in effect even when the contaminated field is planted to crops other than lettuce. Effectively preventing the spread of Fusarium oxysporum f. sp. lactucae from infested to noninfested fields requires thoroughly removing contaminated soil from tractors, farm equipment, irrigation pipe, harvesting equipment, and footwear before leaving the infested field. Crop rotation. Research has shown that the lettuce Fusarium pathogen can colonize roots of living tomato, cantaloupe, watermelon, cotton, broccoli, cauliflower, and spinach plants without causing disease symptoms (Hubbard and Gerik, 1993; Scott et al. 2013). Also, pathogenic Fusarium oxsporum can grow on organic matter such as crop residue. The importance of nonhost plants and organic matter in sustaining the population of Fusarium oxysporum f. sp. lactucae in soil is unknown; however, the value of crop rotation as an effective management tool for Fusarium wilt on lettuce is questionable. Bare soil fallow. In an Arizona/California microplot study (Scott et al. 2012), when soil containing Fusarium oxysporum f. sp. lactucae was maintained free of plants and not irrigated, the pathogen population decreased over time, with an estimated half-life of 5.9 ± 0.7 months (time interval required for pathogen population to decline to 50% of the original level). Using this estimate, a one to two year bare soil fallow period may reduce the pathogen population by about 75 to 93%, respectively. These results should be considered preliminary findings until confirmed by further research. Treatment of soil with fumigants and fungicides. In one Arizona field trial, a preplant application of metam sodium (Vapam) reduced disease incidence at crop maturity by 44% in a subsequent planting of a susceptible lettuce variety. In another Arizona field trial, an at-seeding application of thiophanate-methyl (Topsin M), fludioxonil (Cannonball), or boscalid+pyraclostrobin (Pristine) had no suppressive effect on development of Fusarium wilt of crisphead lettuce. Cultural practices. Soil temperature has a profound effect on development of Fusarium wilt of lettuce. 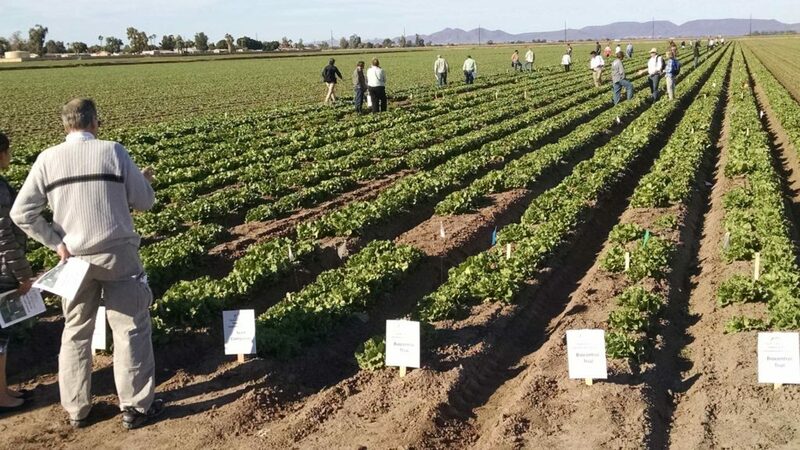 In two Arizona field trials, the proportion of 11 different lettuce varieties that were diseased or dead was 83.2, 10.0, and 1.5% when seeded in September, October, and December, respectively (Matheron et al. 2005). When lettuce plantings were started in these respective months, the mean soil temperature at the 4-inch depth during crop growth was 78, 59, and 57°F. Planting late in the lettuce production season can dramatically reduce disease incidence and crop loss in infested fields. Disease incidence on romaine lettuce generally was much lower than that on crisphead lettuce. In the same two field trials mentioned earlier, that were conducted in 2002 and 2003, the mean incidence of diseased or dead crisphead lettuce plants sown in September, October, and December was 94.0, 23.0, and 1.3%, respectively. On the other hand, the incidence of diseased or dead romaine plants for the same planting months was 34.0, 0.7, and 0.2%, respectively. Field trials conducted in 2002, 2003, and 2015 have demonstrated that romaine lettuce cultivars in general are significantly more tolerant to Fusarium wilt compared to crisphead lettuce. Continued evaluation of crisphead cultivars currently available or in development will occur in 2016 and beyond. Summer soil solarization. In four separate field trials in Arizona, summer solarization of soil (covering moist soil with clear plastic) for 30 days reduced the incidence of Fusarium wilt on a subsequent crisphead lettuce planting from 42 to 91% compared to nonsolarized plots (Matheron and Porchas, 2010). This procedure can significantly reduce the population of Fusarium oxysporum f. sp. lactucae in soil and the resulting incidence of Fusarium wilt in a subsequent lettuce crop; however, care must be taken to avoid incorporating untreated soil from the furrow into the treated bed. In October of 2015, with funding received from the Arizona Department of Agriculture’s Specialty Crop Block Grant Program, the Yuma Center of Excellence for Desert Agriculture (YCEDA) teamed with Dr. Barry Pryor, Professor of Plant Pathology and Mycology at the University of Arizona College of Agriculture and Life Sciences, to host an international symposium on the disease. The symposium was not just a research symposium, but rather a meeting of the minds of industry and academia from around the world. Researchers shared their work, and the knowledge they had learned. They came not just from California and Arizona, but also from Italy, Brazil, and Japan, where the disease seems to have originated in the 1950’s. The grower/PCA community soaked up all the knowledge and ideas offered, but they also returned the favor to the researchers: they shared what they were experiencing in the field, what they had tried, what had worked, and what had not worked. This mixing of industry and academia was by design – it is exactly what the founding fathers had in mind when they created the privately-funded Center of Excellence. 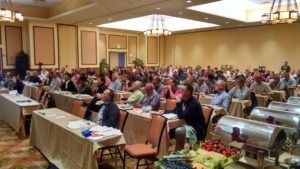 With over 175 people in attendance in the middle of the Yuma, Arizona winter produce season, the symposium definitely accomplished one thing: raising the profile of the disease. It became clear that it isn’t just a desert problem, but is increasingly affecting production areas in central California also. Not to mention the challenges faced in other countries previously mentioned. And it is spreading. Over 175 attendees participated in the Center’s International Symposium on Fusarium wilt of lettuce in November, 2015 in Yuma, Arizona. It had been 12 years since researchers had tested the effectiveness of lettuce varieties and chemical and biological controls in Arizona commercial field trials. The problem with that time lapse was made glaringly clear at the symposium: growers complained that the research data on resistant varieties had all been gleaned from old varieties that were no longer in use. What they needed, they said, was annual field trials testing current varieties and crop protection products in commercial fields infested with Fusarium wilt. And trials of varieties under development would be a bonus – speeding up the introduction of these hoped-for silver bullets. Fortuitously, the Center had teamed up with Dr. Matheron and Dr. Pryor to conduct just such a field trial, and the trials were on display for the symposium audience to observe. The results of these trials were made available at www.DesertAgSolutions.org to everyone, just in time to help with planting decisions for the 2016 fall produce season. Attendees of the November, 2015 International Symposium on Fusarium wilt of lettuce examine the commercial field trials of varieties and crop protection products for efficacy against the disease. Trial results are available at www.DesertAgSolutions.org. Following the seminar, the Center worked collaboratively with researchers at UC Davis and the University of Arizona to apply for grant funding to conduct annual variety and crop protection field trials in California and Arizona, as well as developing a tool to rapidly measure the extent of disease pressure to be expected on a field-by-field basis and devising tools for early detection of the disease in the lettuce plants. To date, we have received funding for Arizona field trials and early/remote detection of the disease. New field trials are underway as of September, 2016. 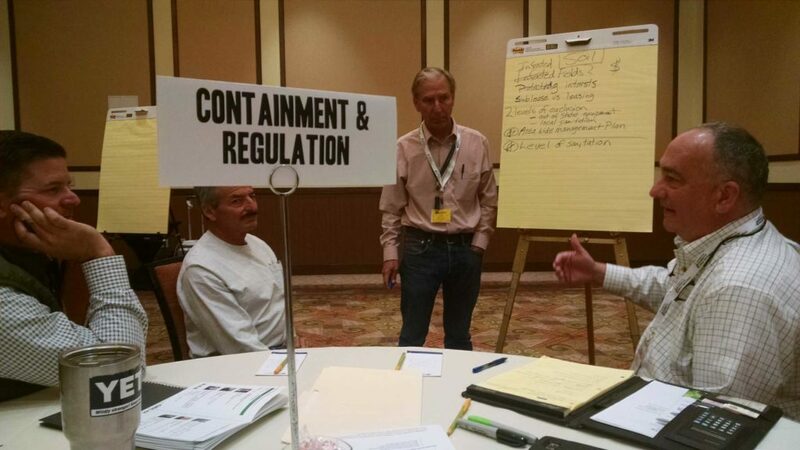 Another feature of the international symposium was a brainstorming session that brought together experts in the areas of Cultural Practices, Breeding and Resistance, Product Development, Containment and Regulation, and Resources and Funding. This resulted in five pages of suggested steps forward, which are available at www.DesertAgSolutions.org. The ideas range from creation of an international consortium focusing on soilborne diseases of leafy greens to development of Best Management Practices for seed and soil health, speeding up development of resistant varieties, and developing multi-disciplinary disease management approaches. Experts in the areas of Cultural Practices, Breeding and Resistance, Product Development, Containment and Regulation, and Resources and Funding came together to brainstorm possible paths forward in the fight against Fusarium wilt of lettuce. This group of experts will come together again to take concrete steps to implement the ideas generated during brainstorming. Priority will be given to those ideas ranked highest in a follow-up survey of the symposium participants. Another promising project that the Center is moving forward on is applying Big Data Analytics to USDA research and growers’ historical data to determine the triggers of disease outbreaks. Then, with real-time sensor data and climatological predictions, growers and PCA’s will be armed with additional decision tools to make choices that mitigate disease incidence and severity. Field work starts this fall, and you can rest assured that Fusarium wilt will be the first target in their crosshairs. Final comments. There is no single magic bullet that will eliminate Fusarium wilt as a disease of concern for lettuce growers in California and Arizona. However, implementing an Integrated Disease Management (IDM) program using proven strategies outlined above can provide a meaningful level of disease control. Possible future development of resistant crisphead varieties and validation of other potential disease management tools through additional research may provide new IDM strategies in the future. It is the goal of the Yuma Center of Excellence for Desert Agriculture that, thanks to the power of industry and academia working together, Fusarium wilt becomes just another nuisance rather than the severe threat that it is today. Hubbard, J. C., and Gerik, J. S. 1993. A new wilt disease of lettuce incited by Fusarium oxysporumf. sp. lactucum forma specialis nov. Plant Dis. 77:750-754. Matheron, M.E., McCreight, J. D., Tickes, B. R., and Porchas, M. 2005. Effect of planting date, cultivar, and stage of plant development on incidence of Fusarium wilt of lettuce in desert production fields. Plant Dis. 89:565-570. Matheron, M. E., and Porchas, M. 2010. Evaluation of soil solarization and flooding as management tools for Fusarium wilt of lettuce. Plant Dis. 94:1323-1328. Scott, J. C., Gordon, T. R., Kirkpatrick, S. C., Koike, S. T., Matheron, M. E., Ochoa, O. E., Truco, M. J., and Michelmore, R. W. 2012. Crop rotation and genetic resistance reduce risk of damage from Fusarium wilt in lettuce. California Agriculture 66:20-24. Scott, J. C., McRoberts, D. N., and Gordon, T. R. 2013. Colonization of lettuce cultivars and rotation crops by Fusarium oxysporum f. sp. 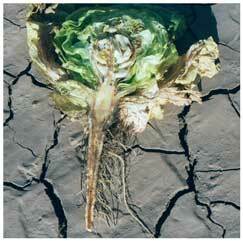 lactucae, the cause of Fusarium wilt of lettuce. Plant Pathology 63:548-553.